After 18 months of careful planning and preparation, Pacific Counter has finally opened their doors to the public. The eatery is the latest addition to the 600 block of Central Avenue, adding poke bowls and sushi burritos to an area of town becoming increasingly known as a culinary destination. But lets back up for a second. What is poke? By definition, ‘poke’ means ‘to cut’ in Hawaiian and it refers to diced raw, marinated fish that is tossed with veggies and umami-loaded sauces and then served over a bed of rice. You can think of it as deconstructed sushi. Or if the trend continues to rise in popularity, you could consider poke the future of sushi in America. Pacific Counter is the brainchild of three heavy hitters in the Tampa Bay restaurant scene — Tanner Loebel, Chitthasack Noythanongsay (known as Chef Tock), and Eric Bialik. And although poke and sushi burritos are available at a few Tampa Bay restaurants, the partners at Pacific Counter take these chef-driven dishes to an entirely new level. Loebel essentially developed an entire industry when he founded FOODNOW, a food delivery service, in 2011 at the age of 25. This was before the existence of UberEats, DoorDash and others. After six years of positive growth, he sold FoodNow to Bite Squad. For Pacific Counter, Loebel brings with him over 300 relationships with Tampa Bay restaurants and extensive experience in restaurant development. Chef Tock is one of the last classically trained master sushi chefs in the Bay area. Originally from Laos, Tock moved to St. Pete over 30 years ago. Since then, he has helped launch sushi programs at Roy’s Restaurant, Samurai Blue, and Sushi Rock Grill. Chef Tock has developed the recipes for every menu item at Pacific Counter. Bialik has considerable experience in cocktailing and restaurant operations having been general manager at two Tampa institutions, Ciro’s Speakeasy and Grille One Sixteen. He is a jack-of-all-trades for Pacific Counter, responsible for crafting the beverage program, working behind the bar and everything in between. With these three at the helm, Pacific Counter seems almost destined for success. As you step foot into the restaurant, you’ll notice that Pacific Counter is absolutely overflowing with St. Pete vibes, such as the beautiful stone hexagonal floors, paying homage to St. Pete’s colored hexagon-paved sidewalks. All of the plants and succulents scattered throughout the space have been furnished by St Pete’s own Jamie O’Berry of O'Berry's Succulents. Walking through the restaurant, you’ll pass by four incredible works of art of commissioned by local artist David Williams. Each piece represents a region of influence for Pacific Counter — Japan, Hawaii, Southern California and, of course, St. Pete. Japan is where sushi was created, Hawaii is where poke was created, So Cal has been credited with bringing poke to the United States, and St. Pete is where Pacific Counter was created. The concepts branding was developed by the design gurus at St. Pete's Hype Group. They also assisted with Wannemacher Jensen, who was responsible for the design/build on the project, to help transform the 1,950 square foot space into a light, bright, and refreshing experience. A neon sign hanging on the back wall asks Pacific Counter’s fundamental question — “Roll It or Bowl It.” In other words, poke bowl or sushi burrito? As diners work their way down Pacific Counter’s assembly line, they’ll get their choice of base, proteins, mix-ins or toppings, and house-made sauce. Between the four bases, ten proteins, thirty mix-ins or toppings, and eight sauces that are offered at Pacific Counter, there are endless combinations (actually 133,562,880 different combinations) to choose from! However, if you’d rather not customize your meal, you can choose from one of the ten Counter Creations, such as the Golden Hour, which consists of salmon, krab, avocado, scallion, carrot, cucumber, shredded nori, mango and Counter Sauce. And for those who don’t eat sushi, Pacific Counter offers non-seafood protein, such as chicken and tofu. Additionally, Pacific Counter has made a conscious effort to provide options to vegans and vegetarians. Nearly everything on the menu can be made vegan, except for three of the house-made sauces. Despite being a fast-casual restaurant, Pacific Counter is not cutting any corners when it comes to quality. A market fresh board displays ingredient origin and type, such as where the salmon was caught or what type of mushrooms are currently being offered. 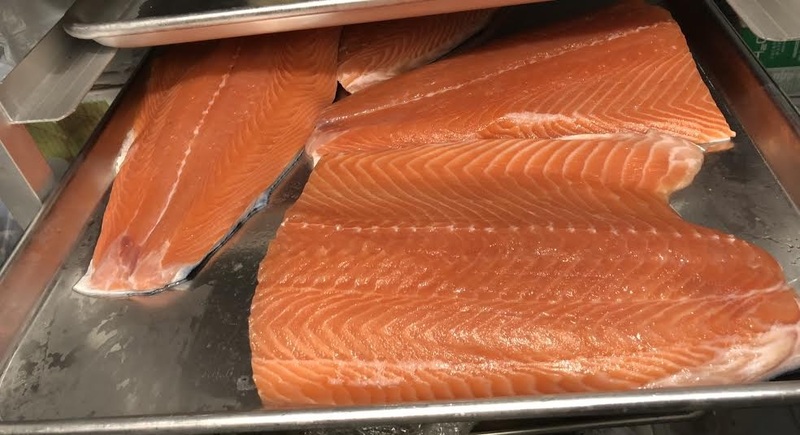 Speaking of salmon, Pacific Counter uses Skuna Bay salmon, which are raised off the coast of Vancouver Island in glacier-fed waters. “The Skuna Bay process of harvest, hand cleaning, selection and packing by their 6 approved salmon inspectors ensures that only the best 6% of harvest make the Skuna Bay standard,” according to their website. “We know who the farmer, puller, scaler, who shipped it off to the minute. We can trace the fish back 7 generations,” says Bialik. Once the whole fish arrive in the morning, Chef Tock filets the fish for the lunch and dinner service. All of the mixed greens, kale, microgreens, and radish are grown at Brick Street Farms, Downtown St. Pete’s only hydroponic urban farm. Brick Street utilizes environmentally-controlled freight containers to grow all of their greens and produce using climate control systems, LED lighting for sunlight, and water filtration and nutrient supply systems. After harvest, the greens and produce travel about a mile away to Pacific Counter. With so much thought going into each ingredient, you’d think the prices would be exorbitant, but it’s really quite affordable. Regardless of whether you selected a poke bowl or sushi burrito, Counter Creation or build your own, chicken or salmon, the price is always $12. Do you want a salmon bowl with five servings of avocado? Still $12. You will never be surprised when you reach the register. all juices are made in-house. flavors will rotate periodically. Still hungry? Pacific Counter also offers sides such as edamame, tuna or salmon poke nachos, seaweed salad and miso soup. For dessert, don’t pass on the Dole Whip, a refreshing pineapple soft serve (Yes, the same stuff they serve at Disney World). You’d never know by the taste, but Dole Whip is gluten free, dairy free, cholesterol free, 100% vegan, and kosher. Best of all, the tropical dessert is guilt-free — only 80 calories and $2.50. The creativity doesn’t stop at the food though. Pacific Counter offers various unique drink creations from homemade juices and sake slushes. Also available are local beer, wine, coffee, Mother Kombucha and coconut water served in a branded Pacific Counter coconut. There will always be three rotating homemade tropical juices available. Currently, the lineup is a coconut basil lychee lemonade, a sparkling pineapple ginger lemonade, and a honey hibiscus palmer. $2.50 allows you to fill up your cup as many times as you’d like! And everyone knows you can’t have sushi without sake. Pacific Counter has kicked it up a notch with their rotating Sake Slush. Currently available is a Japanese Mule, which is very similar to a Moscow Mule but with sake instead of vodka. When visiting Pacific Counter, it’s clear that Loebel, Tock, Bialik and others have devoted an enormous amount of hard work and passion to this restaurant. Pacific Counter is located at 660 Central Avenue in Downtown St Petersburg, FL (formerly Fortunato’s Italian Market). When you visit, be sure to take a peak behind the restaurant for an incredible Pacific Counter-themed Chad Mize mural. Currently, their hours are Sun-Thurs from 11am to 10pm and Fri-Sat from 11am to 12am. Follow Pacific Counter on Facebook and Instagram and be on the lookout for their brand new website to launch soon with online ordering.